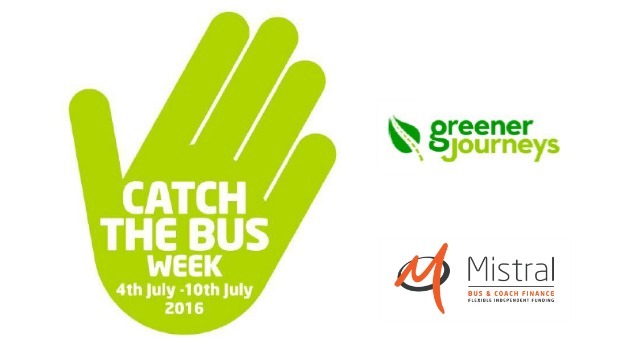 Catch The Bus Week 2016 is coming – Operators, are you prepared? It may come as no surprise to those of us in the business but the fact that buses are Britain’s most widely used mode of transport can come as a surprise to the public. Despite this, operators don’t always get the credit they deserve for being part of the bigger picture in reducing green house gas emissions, helping the elderly, frail and people with disabilities to access important appointments and giving mobility freedom to those people without private transport. Mistral recognises this and we will be joining in this year’s Catch The Bus Week, July 4-10, to help to encourage even more people across the UK to consider the advantages of bus travel. The week, organised by Greener Journeys, successfully encouraged nearly 250 bus operators to participate in 2015 and a noticeable increase in passenger journeys was reported. Catch the Bus Week 2016 organisers are encouraging the public to contact their local bus providers to find out what activities are planned so it’s not too late to get involved. Consider holding a competition or giveaway via social media or your website and use the hashtag #CTBW on Twitter. The CTBW team are promising to support any events with publicity so check out the website and get in touch to let them know what you will be doing or for ideas. Organisers say 23 MPs got actively involved last year so consider inviting your local politician to the depot. For more ideas and to access your own CTBW supporter pack, visit www.catchthebusweek.co.uk.